Daphne d'Offay at Ocean Independence has listed the 38m motor yacht Namoh for charter in Florida and the Bahamas this season. With naval architecture by Mulder Design, Namoh is one of the finest yachts built by Cheoy Lee in 2003 for an experienced owner. This semi-custom tri-deck features an outdoor spa pool, alfresco dining options, a bar, formal dining saloon, good sunbathing areas as well as generous interior accommodation for up to 10 guests in five cabins. 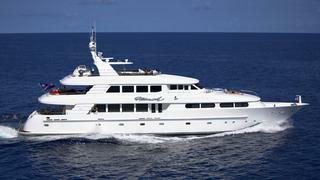 Namoh is available for charter at weekly rates starting from $89,500.